Editor’s Note: The Eco-Stewards Program is entirely grassroots and is sustained by the grace of God in addition to the energy and passion of a handful of volunteer leaders. This year’s Eco-Stewards trip was a new experience for us as we invited nine young adults at various stages in their lives to join us for our program entitled Aloha ‘Aina. Past participants, speakers, hosts, and inspirational voices converged on the island of O’ahu for a special edition of Eco-Stewards that looked to further expand our networks, partnerships, and relationships with those engaged in meaningful work that mixes faith and environmental action. Represented among us were a variety of perspectives, backgrounds and spiritual practices including followers of the Roman Catholic faith, a practitioner of Traditional Longhouse spirituality, a leader from the African Methodist Episcopal tradition, mainline Protestants, Evangelicals, a follower of Thich Nhat Hanh’s Plum Village Tradition and some self-identified Christian-anarchists. We were warmly welcomed by one of our core Eco-Stewards Leadership Team members, Rev. Liz Levitt, and her Kailua congregation, Christ Church Uniting Disciples & Presbyterians. Through this congregation and its community ties, our group of mostly mainlanders were introduced to Hawaiian culture as we learned from local taro farmers, worked alongside fisherman rejuvenating ancient fishponds, and were captivated by the stories of Polynesian voyagers validating Hawaiian history. Our week also included a visit to a charter middle school focused on deeply integrating sustainability into their curriculum, a local chocolate factory committed to buying directly from growers to ensure fair working conditions for both the land and people, and an NGO set on moving Hawai’i toward 100% renewable energy. Everyone we met “talked story” about how their faith and their pursuit of justice for both people and the land intersect with their daily lives. During our time together, Hawaiian words like ‘aina (land), kai (water), and ohana (family), gave us insight into the collective understandings held by the people we met. As we listened to these stories, our group reflected upon our own work, both individually and collectively, as people of faith working toward a brighter future. Our trip concluded as we reflected upon our experiences, shared our own stories, and envisioned the work that lay ahead of us. Like all Eco-Stewards trips, learning the local land from the host community helps participants to re-vision their daily work and what lies ahead in their own community and landscape. We are grateful for this time together, the voices we heard, and the places we visited. It is the richness of this time that allow us to continue our mission of building and sustaining a grassroots community that shapes young adult leaders through place-based experiences that connect faith and the environment. 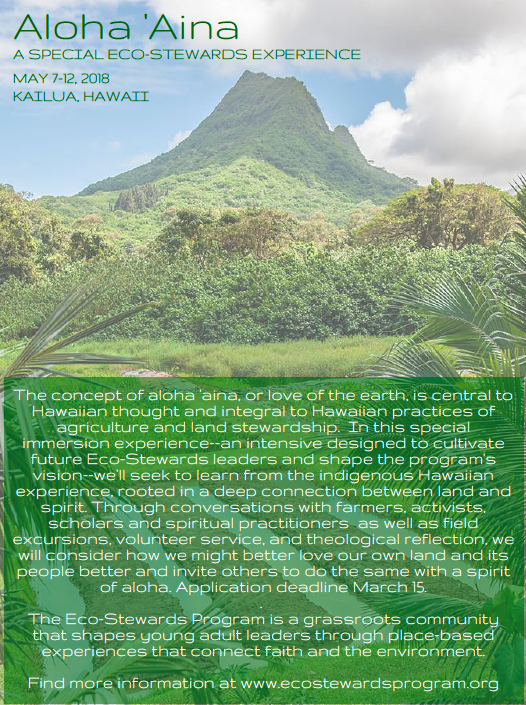 If you want to learn more about The Eco-Stewards Program or how you can connect with us, check out our website, and read more about the Hawai’i trip here. 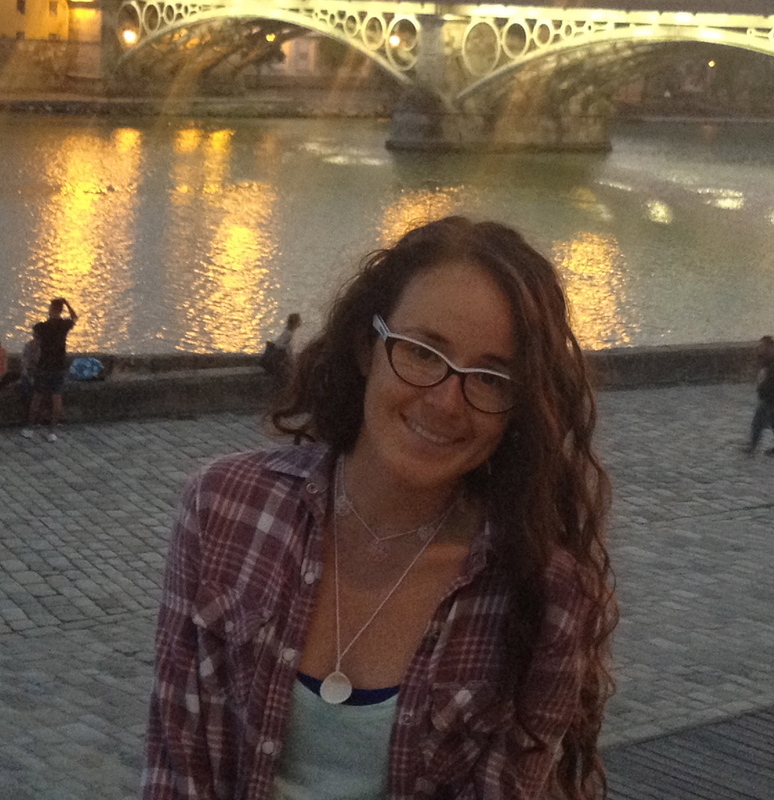 Bio: Vickie Machado has been involved with the Eco-Stewards Program since 2011. She is a third generation South Floridian, who is passionate about water issues and loves being in the ocean.